WASHINGTON (Reuters) - Congressional Democrats on Thursday demanded emergency hearings in the U.S. House of Representatives to investigate President Donald Trump's ouster of Attorney General Jeff Sessions, calling the move an effort to undermine a federal probe into Russian meddling in the 2016 U.S. election. In a letter saying the move placed the country "in the throes of a constitutional crisis," House Judiciary Committee Democrats demanded action from the panel's Republican chairman, Bob Goodlatte, and called for bipartisan legislation to protect Special Counsel Robert Mueller from any effort to stymie the probe. During the Thursday conference call, House Democrats said they would attempt to include legislation protecting Mueller's investigation in an appropriations bill that Congress is due to consider later this year. 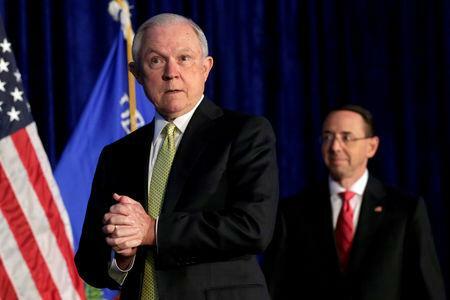 Sessions' ouster "just makes us all the more want to make sure we have that special counsel protection bill passed or added to any spending bill that may be moving in the (end-of-year) session," said Representative Mark Pocan. "We are watching what appears to be continued obstruction by this White House,” Pocan said in a telephone interview. He said Democrats were concerned about what the Trump administration might do next concerning the special counsel probe: "Anyone writing even a dime-store novel knows what the next couple of steps are on this." Asked to comment on the Democrats' call for a special counsel protection bill, a spokeswoman for the office of House Speaker Paul Ryan, a Republican, referred to past remarks by Ryan. He has said he does not believe there is a need for Congress to pass legislation aimed at protecting the special counsel from termination.